1) Black Cameo - This little present came from an antique store in California. In addition to being a cameo, it's also a locket. While I already have one cameo, that one is edged in gold and has traditional coloring. I find that the black and silver of this one give it an edge that goes well with multiple outfits; it's girly and vintage because it's a cameo, but it's less sweet than if it were in pink and gold. I've worn it more often than not in the last week. 2) Peacock Pencil Box - This box is far from new; I got it at Papyrus at least four years ago. The wood is dark and smooth, and the painted peacock bright and silly. It's been sitting on my desk all through college, holding onto a bunch of colored pens and highlighters for me. 3) Red Leather Watch - My purple watch betrayed me back in January, falling off my wrist without me noticing. I haven't been sure since then whether or not to replace it, or whether if I did replace it I ought to invest a few more dollars and get something nicer. But I got another World Market one last week. It is leather this time, though. And it has a buckle so it won't fall off. 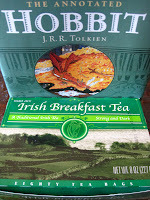 4) Irish Breakfast Tea - Last month around St. Patrick's Day, I kind of wanted some sort of food item for the holiday. There wasn't much to chose from. 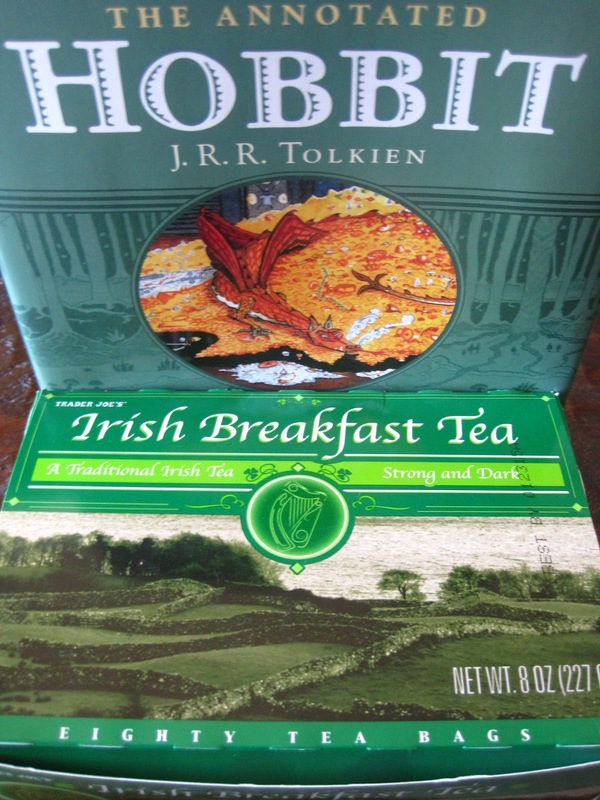 But I did get this tea at Trader Joe's (I think it was $3, for 80 tea bags). Although I usually like my tea dark (and without anything added to it), this tea is quite dark. So I figured out that, instead of brewing it for as short a time as possible, it's better to let it brew really dark and then add a little almond milk--as Liz Curtis Higgs suggests in My Heart's in the Lowlands. Given that I've gotten bored of coffee again, this has been my morning drink lately. 6) Green Bowl - My green glasses, tea cup, to go cup, and pasta strainer weren't enough. As such, I have finally acquired a bowl from Anthropologie. Yes, just one: that's all I need right now. It is green. 7) Brown Bebe Shorts - Ah, summer is upon us. I think I have now worn pants for the last time until October, possibly September. Capris and dresses are also very well, but here are some shorts also. I may not have actually bought them at Bebe. I'm not always a big fan of Bebe's style, anyway, but these shorts fit, the material is durable, and the brown fabric with light polka dots is styled but also plain enough to be a basic. 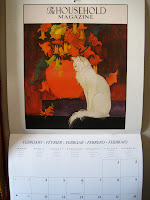 8) Cat Calendar - Since I'm sharing things that hang out around my desk, here is my calendar. I got it at the famous Changing Hands bookstore, which I guessed (correctly) would have a more unique selection of calendars. I'm not a cat lady; I just thought the look of these images (vintage cat posters) was close enough to my style to work on my wall. I use my iPhone's calendar, but the visual just isn't the same. I like to look up and see the month in front of me. 9) Flower Sandals - Phoenix has now reached 100 degrees for the first time this year; from here, the city will spiral into temperatures of doom. Since not even flats are bearable when it's 110 or even 114 outside, here are the new sandals I have picked up. The brand isn't special, but the flowers are leather. Since the color is neutral (less gray than they look in the picture), I'll be wearing them with everything. 10) Final Preparations - I was just looking for an excuse to show my graduation announcements. Most often, I tell people that the idea of graduation hasn't really hit me yet, and it hasn't. But when I look at things like this, I do start to feel a little proud and excited. While I've been at ASU, they have combined the English and Film departments. I really don't know exactly what that means, except that I sometimes get announcements that pertain more to Film than English majors--but that could still be of interest to both. And that gets me thinking about the future of literary and film criticism. Today they are separate but with some overlaps; might they come even closer together in the future? I have taken a few English classes that have a strong film element. Some of the films have been adaptations of books we have read; some have just dealt with the same story (King Arthur, for instance). Adaptations seem to be where most of the literature/film overlaps are today, especially given the commonness of adaptations. But this isn't the only type of overlapping that I can think of occurring. When you study literature, you learn about different movements. 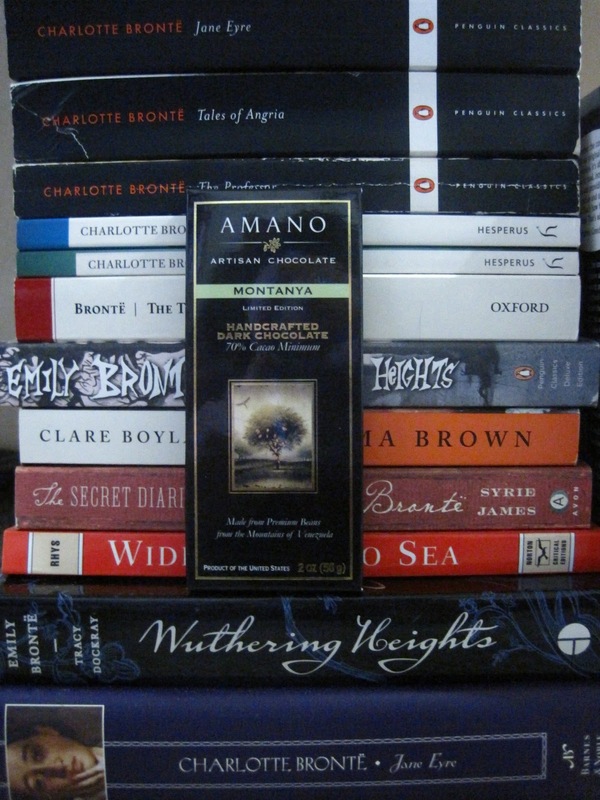 Romanticism, Victorian novels, Gothic novels, the Harlem Renaissance, Modernism, Post-Modernism, etc. Film has terms like this, too, although not perhaps as many since film is a newer art medium than literature. Film noir is one. My question is, are these labels ever going to start overlapping? Will one label come to cover both books and films from a certain period? When you learn about traits of Romanticism, for instance, you find that they also apply to many of the paintings from the period. And when I consider authors I have little interest in (like John Steinbeck and Ernest Hemingway), I sometimes find that I also have little interest in films from the period. Is that just coincidence? Considering that art always, in one way or another, responds to what came before it, I think not. "Oh, waves, there are waves." But what type of waves, exactly, are there? Many kinds, I say. When Blondfire's song "Waves" first appeared online, I instantly dubbed it a favorite because of its duality (you can read that post here). Waves can either be the struggles that put you down or the forces that lift you up and into new places--and often they're the same thing. Now "Waves" has its own music video, shot in the So. Cal. desert, that continues the theme of duality. As you know, I'm bound to love the desert setting of this video. Gorgeous desert and pretty, crumbly mountains mean I'm happy. But perhaps you wonder why a song about waves doesn't have an ocean backdrop? Ponder that a moment and look a little closer. There are waves in this video: the ripples in the sand, the curves of the mountains/hills, and even the flow of fabric in Erica's outfits. These are the harsh things, the ones "picking you up, pushing you down." Desert heat and wind--the elements and Nature. But as she wanders about, Erica also finds signs of water. An anchor, a starfish, and even the nature of the desert suggest that there once was water here--and that perhaps it might come again. She is searching for the waves, knowing their power. She is wandering away from the waves, knowing their power. As William Blake seemed to say, only by recognizing duality can you make progress. 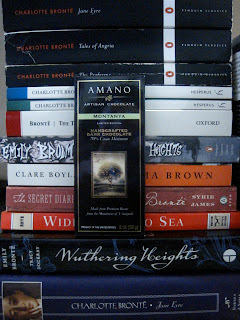 Back in March, I wrote about some of my favorite poems from the Brontës in a copy I got from the university library. While the copy of my own I have now acquired is not nearly as exciting in looks, it appears to be pretty much the same in content--and font/typeset/whatever-you-would-call-that. This copy is part of the Classic Reprint Series and was in fact just published last year. While it is an unexciting paperback, it was also a simple price of eight dollars--compare that to other prices you might find for Poems and you'll appreciate what this series does. It's making rarer, "Forgotten Books" available to the public at an affordable price. And what I was trying to explain about the "typeset" was that I believe the format and font and everything of this book is identical to the original published copy of Poems. 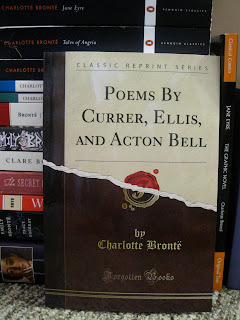 Hence the phrase "classic reprint" rather than simply "forgotten classics." In the back, there is even a page with original advertisements for the sisters' novels--which, you'll note, were published after the first publication of Poems. If you go to the Forgotten Books website, you can download up to five ebook versions for free if, unlike me, you prefer ebooks to physical copies. It's the story of a poor man's daughter who, after her father tells the king she can spin straw into gold, falls into tears because she will be killed when she fails to complete the impossible task; a strange little man appears and helps her but ultimately asks for her first child in payment, a cost which she is only able to avoid after discovering that his name is Rumpelstiltskin. So what is it about this story that made it one of my favorite fairy tales, and what might it mean? Going off of the Grimm versions, while some fairy tales are several pages, this one is quite short. I think that length gets your imagination going, filling in the blanks that the story doesn't go into. Why was such a poor man even in conversation with the king? Why did he tell him such a ridiculous fib when all it could accomplish was to get his daughter into trouble? Was she happy about marrying the king? Who is Rumpelstiltskin and where did he come from? Was it good that she accepted help from him? What does it mean that she beat him in the end by saying his name? Back in middle school, I imagined how fairy tales could make great reads as novels--and I obviously wasn't the only one to have that thought. For Rumpelstiltskin, I imagined that the poor man's daughter would already love the king, and that's why she would be glad about marrying him. I could never reconcile that part of the story if I thought that she didn't love him. But the truth of the matter is, the king is just the ultimate good marriage. From a traditional or patriarchal point of view, she gains everything there is for a woman to gain by marrying him. But Rumpelstiltskin threatens the other traditional feminine role, motherhood. By asking for her child, he is threatening the traditional idea of a family. But why does he want the child? I always wondered that. From her point of view, it is the ultimate threat, but what does he have to gain from taking a baby? This brings us back to the question of who Rumpelstiltskin is. At the end of the story, he stomps his foot in anger, it becomes cloven in two, and he disappears into oblivion. Maybe he didn't die; maybe he just went somewhere else. Because cloven feet, well, that's satanic imagery right there. Taking Rumpelstiltskin as a demon would explain why he wants to steal away someone's child: he wants to ruin souls, spread evil, and that sort of thing. If the woman achieves a certain victory over him by discovering his name, it is because she is rebuking him with the power of words. If Jesus's name has power, then it makes sense for a story to also give some sort of power to demon's names. When the woman reveals Rumpelstiltskin's name, she is pointing out who he is and sending him back to where he came from. But if you go with the idea of Rumpelstiltskin being a demon, it becomes unsettling that the heroine of the story (if that's what you think she is) accepts his help and owes her entire position as queen to him. Is the story, then, endorsing a little flirtation with the dark side as long as you don't let it go too far? And I can't ignore the fact that it is three times that Rumpelstiltskin helps her; three is an important number in religion. Rumpelstiltskin saved this woman's life; what if all he wants is to save her child's life, too? Is he a demon, or something else? Either way, she makes deals with him, and deals are dangerous if you don't understand all the details. But if he hadn't helped her and if her father hadn't put her in a position to need help from Rumpelstiltskin, she and her father would both be lost. Which makes me wonder, did her father know about Rumpelstiltskin? What if Rumpelstiltskin is her father, or her grandfather, or at least her father's friend? It may be a fairy tale, but this male version of the Blue Fairy turning up just as needed is quite the coincidence. Is Rumpelstiltskin good, bad, or crazy? Did he use the poor man's daughter, or did she use him? Before I graduate, there are some things I've been making sure I do or see on campus that I just never got around to before. One thing I had never done was to go inside of the ASU Gammage auditorium, even though The Phantom of the Opera was there a couple years ago and I really should have found a way to make it to that. So when I learned that Beauty and the Beast was doing a couple of performances this month, I said, hello, more perfect timing, and made sure not to miss it. I've probably said this before, but despite enjoying seeing live things like this, I hardly see any at all. In fact, I think this was my first "real musical," which means I'm not counting any for-children productions I may have seen when I was younger. One of the things I really enjoyed was seeing how quickly and seamlessly they turned the sets around. There is fluidity to the choreography not just of the actors but of everything on the stage. The castle set/lighting was properly creepy and all the lights and glimmer during "Be Our Guest" were as expansive and shiny as it gets. I was only disappointed by the library: although the arch of tumbling, oversized books they used fit into the set's permanent arches, I would have preferred to see an arch of shelves. The library is so huge and beautiful in the movie that I wanted to see something more similar to that instead of an abstract "books" image. While I never felt that William A. Martin as Maurice showed enough emotion in his dialogue, Joe Hager gave a great performance as Gaston, really playing with the character. Given that this musical is almost double the length of the movie, they take more time for some of the character developments. We see more, particularly, of the servants and also more tidbits of scenes in general. While not all of the added songs interested me much, some did add a deeper angle or more development. One of these was at the end of Act I; I think it was "If I Can't Love Her." Although I think I would utterly suffocate in New York having Central Park as the only echo of "nature" including the sky, it would also be nice to always have so many productions to go see. Then again, I'm always talking about how Phoenix does have plenty of things play during the year--I just usually don't get to see them. Maybe I'll come back in February for Andrew Lloyd Webber's The Wizard of Oz? How did such randomness turn out so well? Having lived, mostly, in Southern California until I was seven or eight, things like the Hollywood sign were normal and everyday for me. 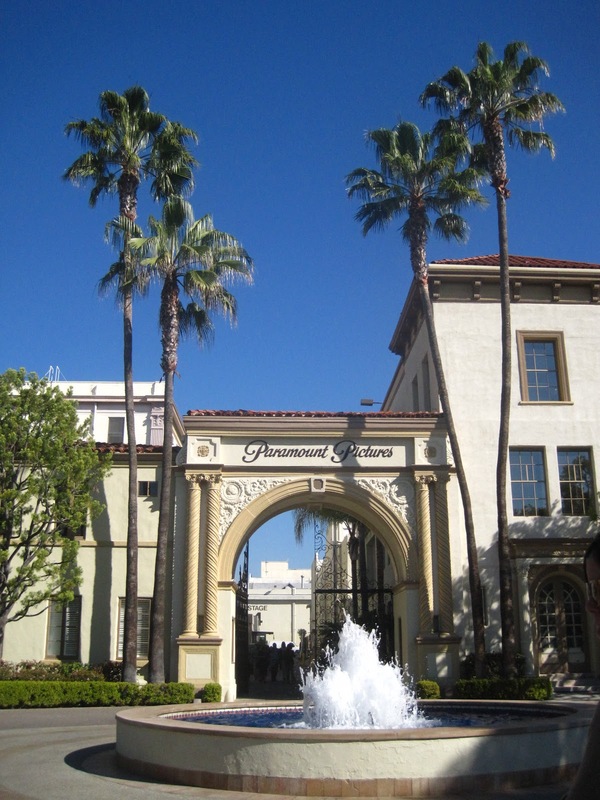 I never had that awe for Hollywood, Beverly Hills, or L.A. because it all just seemed part of the close-by world. But that isn't to say that, even now, I have seen everything there is to see in this the land where movies are made. After lunch in West Hollywood, we parked at The Grove and lined up outside of CBS for a taping of The Late Late Show (with Craig Ferguson). While this probably wouldn't have been on my agenda, this was the first time I had been in a studio audience. I happened to be sitting on one of the edges, so I could see behind one of the set's side walls--you know, "behind the scenes." Simply for the experience of it, I was glad I tagged along to the show. Oh, yes, and the day before, I decided to take a picture of the Hollywood sign for the first time--I had seen it so much before that I never even considered photographing it. In doing so, I learned something: that's a hard sign to photograph what with all the glare and my nonexistent camera skills. While I try and write up a short reaction to most of the books I read on my own, I don't usually post about books I read in class. For one thing, there would be too many: they would overtake the blog. And I also already have to write papers and other assignments on them, so choosing to write extra on school books isn't always what I'm keen to do. But there are exceptions. Yesterday, when I shut the last page of María Amparo Escandón's novel, González & Daughter Trucking Co., I had to pause for a couple of minutes to take it in. I don't always feel that way, where a book has touched my thoughts in a way that goes past enjoying reading it or finding a depth of material for analysis. Given that I was reading this book for a class, there are certainly many layers you can study it under. 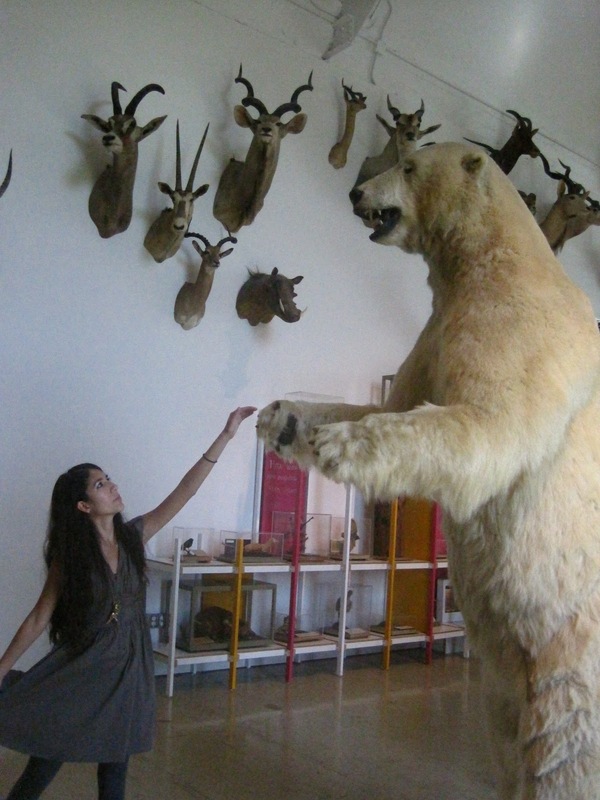 It deals with issues of cultural identity, taking place in both Mexico and the U.S. 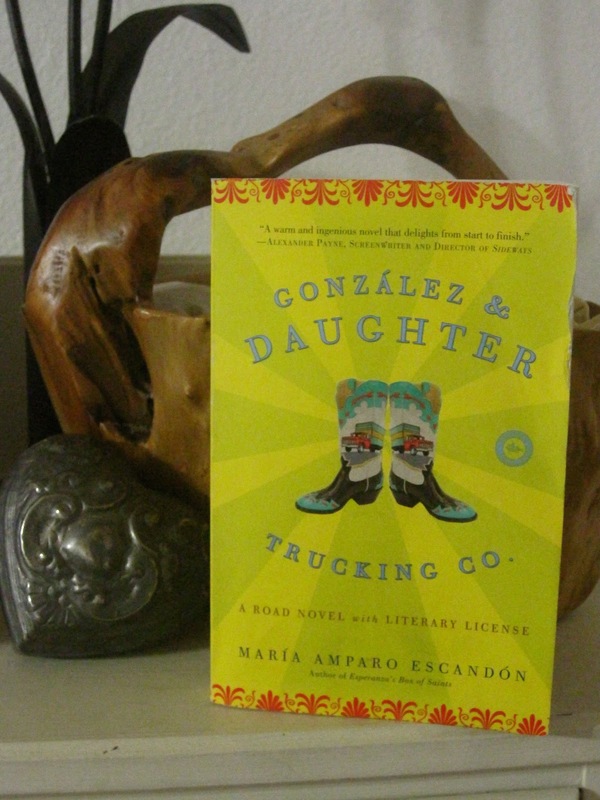 It studies the workings of community and also more personal relationships, most prominently father-daughter relationships (as you can tell from the title--why, asks Escandón, are companies only named "& Son?"). It questions what fear is and where knowledge comes from and how healing comes. It's written in such a format of two, three, or four voices/speakers/lenses that it interacts with the reality of stories and truth. It's also a pleasure to read simply as a story. At our last class, we only needed to have read the first half of the book, but a few people had already finished it. I found that I needed to read the first half slower in order to take everything in, but the second half went by in a breeze. It's a book that tends to beg you to keep reading and reacting to what you read. And that's the special part: the reacting. There are beautiful and poetic moments interspersed in the pages, moments that I really felt for. 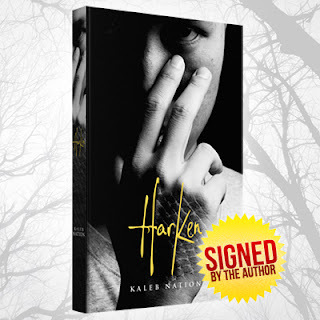 It's a book about a women's prison, a father and daughter on the road for their trucking company, and one woman's journey through discovery, pain, and ultimate healing. Amongst all of the communities and the stories, there are very personal emotions. Click here to read my initial thoughts on The Host. My blog background seems to have disappeared, leaving behind the forest image that was beneath it--the weird thing is that the link to the website where I got the background is still up there in the corner. Will it come back on its own, then? I can't seem to figure out what went wrong, or how to put up a new background. I feel at such a loss. Anyway, guess what movie I went to see again yesterday? The Host, that's right. (And I'm probably going to see it again in the next week or two whenever another friend or two that I'm taking to see it can make it.) Because of my weird movie-watching habits, I'm used to sometimes seeing a movie in a fairly empty theatre. But this time, I was watching with less than ten other people and in (I think) this particular theatre's second largest space. So that did make me feel rather isolated. But when you watch a movie without a surrounding audience, you can tell what it is you like or don't or what makes you laugh and such like. The responses are all yours, not responses based on the general audience reaction. I have a couple of follow-up comments on this movie. The costumes and overall style of the souls really did start to bother me this time. 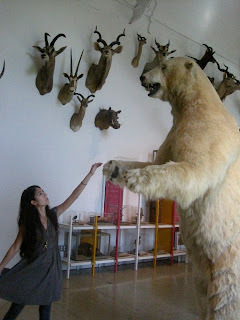 It made it feel less like the souls try to imitate humans. The attitude of the Seekers comes up most often, and so it seemed to most define the souls--but the Seekers are only a select group of souls. So the souls, in the movie, feel like a threatening institution rather than the friendly, honest, and truly-believing-their-way-is-right group that they are. The movie makes it seem like it's specifically Wanda who is this way. I also stared at the landscape some more. Okay, New Mexico was never going to look exactly like Arizona to an Arizonan. But still. And I know that I don't spend much time south of Phoenix (where Picacho Peak is), but when I look at pictures of the area, there's one thing in particular that I see: saguaros! And other vegetation, including gorgeous wildflowers if the season's right. But the movie portrayed this area as rather lifeless--and sandy, as I mentioned before. Considering that saguaros don't grow everywhere, I missed them. But, I say with a sigh, this isn't actually a big deal. Why, though, does Jamie not have an accent if his sister does? Melanie has an accent to distinguish her from Wanderer, but the accent seemed to bypass Jamie. The first part of the movie, you can say, starts slow. But I think what interests me less about it isn't the pace: it's that the "soul style" I talked about above is a primary part of these opening scenes. And while the book, because it is a book, is able to introduce Melanie's and Wanderer's characters early on as separate identities and then to form the bond between them in the desert, these developments of character happen differently in the movie. But both times, as this movie has come forward towards its close, I have found myself in the most buoyant mood. The development happens softly, almost imperceptibly, naturally. That shot of Wanderer's face at the end, when she is saying goodbye to Melanie, that is what this story is all about. So to see Wanderer finding peace and then to see her reawaken and for her community to also find peace is powerful. It's the lingering power of success, emotion, and resolution. Wanderer has literally found herself and where she belongs. That's why I'm loving this little, low budget movie that critics mostly criticize. That's why I'll even sit in an empty theatre to see if if I have to: because it's what I like, and like Wanderer, I don't need confirmation from someone else to choose where I give my attention.